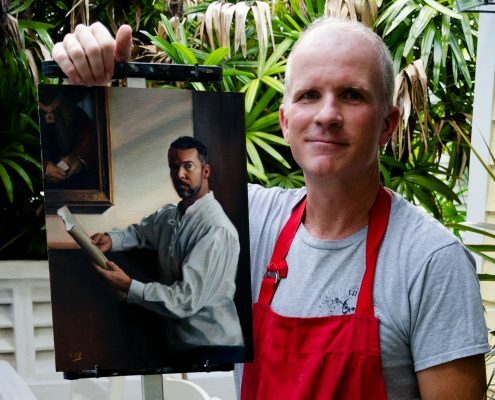 Canadian artist Alan Douglas Ray is a traditional oil painter with a passion for portraiture, figures, still life, and landscapes. His paintings tend to depict quiet, private places with an air of mystery and intrigue. He counts the Dutch Old Masters, especially Vermeer and Rembrandt, and the English Pre-Raphaelites, as major influences. 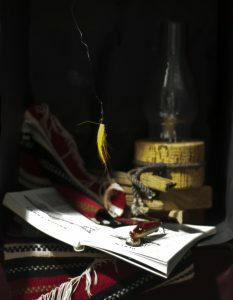 “Message”, pictured above, is typical of his style and tone. It is one in a series of small intimate paintings with the same solitary figure. In this one, the late afternoon sun was streaming into Ray’s studio space, creating a momentary lighting effect that he was eager to take advantage of. The resulting composition reminds him of what Vermeer achieved in his most famous works: a purity of light and form, qualities that convey a serene, timeless sense of dignity. Sometimes the figures in Ray’s paintings gaze directly at the viewer, inviting a response. But more often they’re engaged in their own daily affairs. Here, the subject resents interruptions, so the message better be important. He is impatient so you better say what you have come to say. 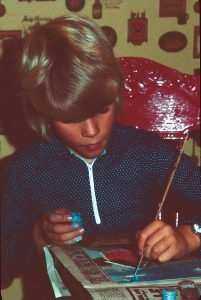 Yet, he couldn’t envision making a career of art. His tastes are “old fashioned”. He didn’t see himself fitting in at any art college where conceptual or abstract art prevailed—and that seemed to be everywhere in those days. Earning a decent living and avoiding debt was a constant preoccupation for him too. Ray chose instead to pursue degrees in political science and international relations. In 1990, he won a prestigious Commonwealth Scholarship, which enabled him to go to London England to study. He eventually earned a PhD in War Studies on the subject of military intervention and peacekeeping. A stint working for a TV producer and screenwriter in the UK led him to the study of playwriting and screenwriting. By happenstance, he eventually found himself working in the fields of technical writing, animation, new media and software development back in Canada. 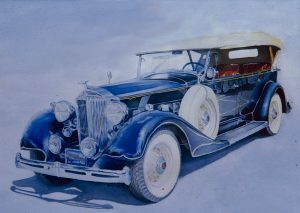 Ray’s first watercolour, “1934 Packard”, 24″ x 18″, in 1984. 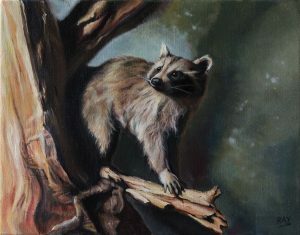 “Bait”, 18″ x 24″, oil on panel. 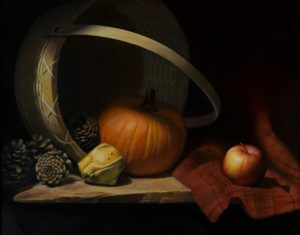 He is now a member of the Ontario Society of Artists, Portrait Society of America, the Oil Painters of America, the International Guild of Realism, and several local art associations. Ray exhibits widely in his home province of Ontario. His work can be found in private collections there and in Alberta, New Mexico, New York, North Carolina, Florida, and London. 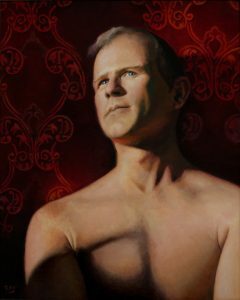 “Listening” (Self-Portrait), 20″ x 16″, oil on panel. 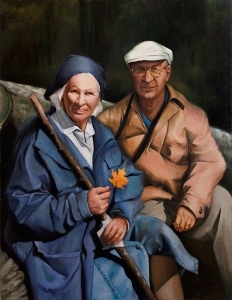 A portrait of the artist’s parents: “Autumn Walk”, 32″ x 24″, oil on linen.